Hepatocyte death following drug intake is the critical event in the clinical manifestation of drug-induced liver injury (DILI). Traditionally, hepatocyte death caused by drugs had been attributed to overwhelming oxidative stress and mitochondria dysfunction caused by reactive metabolites formed during drug metabolism. However, recent studies have also shown that signal transduction pathways activated/inhibited during oxidative stress play a key role in DILI. In acetaminophen (APAP)-induced liver injury, hepatocyte death requires the sustained activation of c-Jun kinase (JNK), a kinase important in mediating apoptotic and necrotic death. Inhibition of JNK using chemical inhibitors or knocking down JNK can prevent hepatocyte death even in the presence of extensive glutathione (GSH) depletion, covalent binding, and oxidative stress. Once activated, JNK translocates to mitochondria, to induce mitochondria permeability transition and trigger hepatocyte death. Mitochondria are central targets where prodeath kinases such as JNK, prosurvival death proteins such as bcl-xl, and oxidative damage converge to determine hepatocyte survival. The importance of mitochondria in DILI is also observed in the Mn-SOD heterozygous (+/−) model, where mice with less mitochondrial Mn-SOD are sensitized to liver injury caused by certain drugs. An extensive body of research is accumulating suggesting a central role of mitochondria in DILI. Drugs can also cause redox changes that inhibit important prosurvival pathways such as NF-κB. 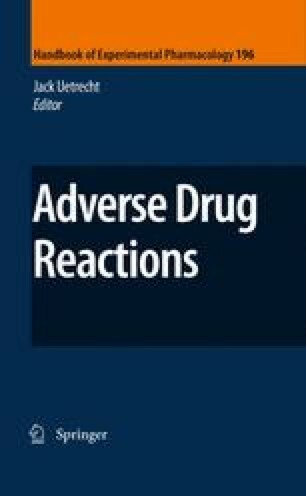 The inhibition of NF-κB by subtoxic doses of APAP sensitizes hepatocyte to the cytotoxic actions of tumor necrosis factor (TNF). Many drugs will induce liver injury if simultaneously treated with LPS, which promotes inflammation and cytokine release. Drugs may be sensitizing hepatocytes to the cytotoxic effects of cytokines such as TNF, or vice versa. Overall many signaling pathways are important in regulating DILI, and represent potential therapeutic targets to reduce liver injury caused by drugs.